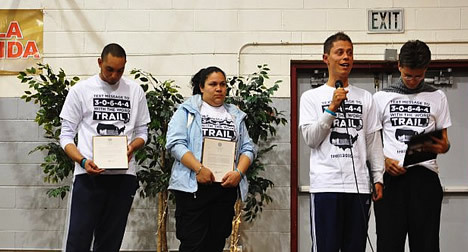 As the new year began, four students began a 1,500 mile walk from Miami to Washington, DC. Each of them – Felipe, Gaby, Carlos, and Juan – are immigrants, three of them undocumented, who have lived in the United States since childhood. In mid-February, they crossed the border into south Georgia. They received a welcome reflecting the legacy of racism and struggles against it in the Deep South. In Nahunta, a small town wedged between the Okefenokee Swamp and the Atlantic, they confronted the Ku Klux Klan, side by side with the NAACP; afterwards they stayed at Koinonia Farm, a radical Christian intentional community from the 1940s. At the end of the month, they were received by a rally of about 150 at Moreland Plaza in Ormewood Park, a working class Black and Latino neighborhood in southeast Atlanta. Residents cheered the four on from the windows as they marched North towards First Iconium Baptist Church. At the church, about 300 people showed up for free food donated by local restaurants and to hear the walkers give speeches. The event was locally organized by GLAHR (Georgia Latino Alliance for Human Rights), GALEO (Georgia Association of Latino Elected Officials) and Alterna, a religious Latino organization. I asked around to see where people heard about the event. GLAHR had leafletted on Buford Highway, the heart of Atlanta’s Others had heard a call out over Radio Free Georgia (WRFG), a community radio station. There were students and local activists in attendance, who heard of the event via a growing network of organizers in the Atlanta area. The Walkers took turns speaking and receiving awards, including a plaque from new mayor Kasim Reed, who commended their journey and spoke of human rights. This was a curious statement from an official that based his campaign on privatizing the city’s resources and continuing policies that encourage gentrification, which has been disastrous for low income African American communities. GLAHR is participating in the National March on Washington for Immigration Reform, on March 20th, and they used this event to help organize. These recent actions – the Trail of Dreams, the March on Washington, and others – may signal a re-emergence of the movement of undocumented workers, one of the most exploited and oppressed parts of US society.